This week on The Bugcast: we croak, we lament, we analyse, we disbelieve, and we play our usual mix of 8 great tracks of independent and Creative Commons music! The next live show will be episode 364, broadcast live in the chatroom on Friday 19 June 2015 at 21:30 UK time (BST/UTC+1). 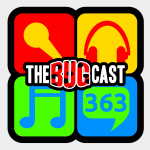 Just wanted to send you all a huge thanks for featuring our song Another Sun on The Bugcast 363. We appreciate you not only playing our debut song, but the discussion about it afterwards.